Feeding Muscovy ducks is an important step in growing strong and healthy birds. The arrangement of the cells, proper lighting and organization of walking is also an integral part in growing but high-quality and balanced diet will help to reduce the risk of disease and accelerate the growth of poultry, and increase the nutritional value of meat. The first day of life duckling – the most important step. The sooner you start feeding the first chick, the sooner we can resolve the remnants of the yolk in the body. After the first feeding, the digestive tract will start operations from which further affects the proper absorption of nutrients. In the first days of the ducklings need to be fed boiled egg, be sure it is finely chopped. Chicks to drink plain water cannot. Before entering the water need to add a little potassium permanganate, so that it looks light pink in colour. 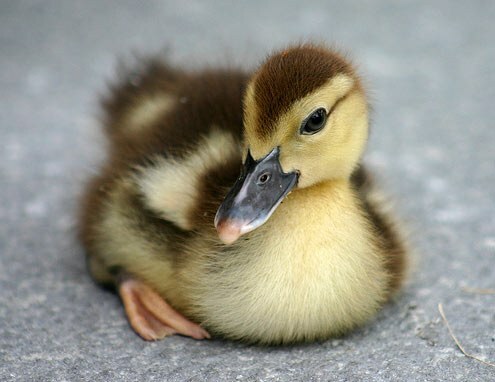 Of course, in the first days of his life, the duckling will not eat and drink because he still doesn't understand. It is important to show each duck that what he gave the mistress, you need to eat or drink. Best ducklings react to moving food. Works pretty much the same technique of sprinkling egg crumbs on the backs of Chicks. They run, crumbs showered with them, and cousins is a great pleasure to collect the food that just fell from the back of the other. So do with goslings. But tapping on the tray of food is useless, it only works with chickens. With watering you will have some trouble. Here it is necessary not only for the bowl of water to knock to let the water start to "move". You have to take each duckling in hand and dipping its beak into the water. As soon as one of the ducklings alone drink, the rest will happily run up to the troughs and the example of their counterparts also begin to drink. While the ducklings are not fulfilled ten days of age, feed them at least 6-8 times a day. From 10 to 25-30 days to feed them 4-5 times a day. And after they turn a month, you can reduce feeding to 3-4 times a day. The next day old ducklings can be put in the crushed egg, oat, corn or barley flour. On the third day in a mixture, described above, can add chopped herbs of nettle, mixed with fish or bone meal. Further, in this jumble you can gradually introduce low-fat soups, meat waste in powdered form and whey. It is important to know that any wet feed mixture must be crumbly. If the food is sticky, it can clog the nasal passages and this often leads to inflammatory diseases. Drinkers of water should be placed not farther than five feet from the feeders. Musk ducks (common, Muscovy ducks) are constantly moistened beaks while eating food. Any feed should always be fresh without a hint of mold or fermentation. Dairy waste ducklings are given only after a full ferment. With twenty days of age ducklings can be introduced into the diet of mashed potatoes. Add it to the composition of the mixture in an amount of about 20% of the mixture. In the forty-day age, you can begin to teach their young to whole grain. Of course, first it must be put into the mixture which is fed to it, and then can be given separately in the last feeding (at night). To allow the ducks to open water should be no sooner than they turn a month old. The thing is that from this age they begin to operate the oil gland, which secretes oil for lubrication of the feathers. Otherwise they will get wet fluff upon contact with water, this will lead to hypothermia and death of Chicks. Of course, Muscovy ducks can well do without walking, but if you have the opportunity to release them into natural body of water, it will reduce the cost of feed by as much as 30%. Before releasing the bird on the water, make sure that the water temperature is not below 10 degrees.